This is our go to recipe when we're making Sticky Chinese Ribs at home with a piece of pork belly. It's well worth the effort and they taste awesome! Get yourself three layers of tin foil, 1-metre long. Place the ribs in the centre, drizzle them with oil and rub all over with the five-spice and a good pinch of sea salt and black pepper. Seal into a tight parcel and pop onto a tray in the middle of the oven for 3 hours, or until just tender and cooked through. Meanwhile, for the glaze, peel and slice the onions and put them into a frying pan on a medium heat with a lug of oil and the star anise. Cook for 15 minutes, or until soft and starting to caramelise, stirring occasionally. Stir in the five-spice for 2 minutes, stir in the rest of the glaze ingredients and leave to bubble away for another 2 minutes, then turn off the heat and leave to cool a little. Fish out the star anise, transfer the mixture to a blender and blitz until smooth, loosening with a splash of water, if needed, then pass through a fine sieve so it’s super-super-smooth. Have a taste and season if required. Trim the spring onions and deseed the chillies, then finely slice both lengthways and put them into a bowl of ice-cold water so they curl up. For a laugh you can randomly score the radishes and pop them into the water for a bit of a naff 80s feel; otherwise, leave them whole or cut them into quarters. When the time’s up, transfer the ribs to the tray, discarding the foil, and turn the oven up to 200°C/400°F/gas 6. Brush a good layer of glaze over the ribs and return them to the oven for 8 to 10 minutes, then I like to keep brushing on glaze and popping them back into the oven every minute after that for a few more minutes, to build up a really good layer of dark, sticky glaze. 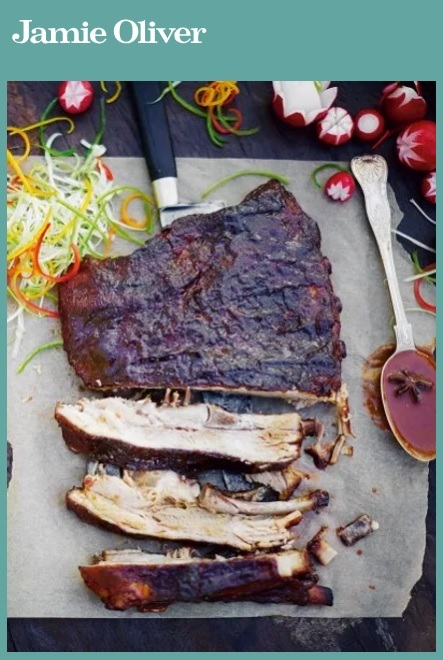 Serve the ribs with a bowl of any leftover glaze for dunking, and with the radishes, chillies and spring onions on the side. JAMIE'S TIP: This is definitely an opportunity to have a finger bowl on the side and a tea towel at the ready.